While Apple is undoubtedly the leading name as far as digital products like iPhone is concerned, it does come with its own set of restrictions. Playing videos on an iPhone is quite a headache if you just use its native video player, which only supports M4V, MP4 and MOV formats and cannot give you the flexibility to play all formats of videos. This is why we need the best video players which could solve our needs. Are you looking for some good media player apps for your iPhone? Thankfully there are a lot of quality video players available on App Store. Here we’ve collected 5 best video players for iPhone. You can reference it and learn some tips about playing videos on iPhone. A good video player has the capability to double your video watching entertainment and experience. It can fill life to your video. We have compiled a list of Top 5 video players for iPhone. All of them could be used on iPhone 8, iPhone 7, iPhone 7 Plus, iPhone 6, iPhone 6S, iPhone 6S Plus, iPhone 6 Plus, and other iPhone models. PlayerXtreme is an amazing video player for iPhone with loads of features that be introduced right now. But for starters, here's the list of video file format it supports: 3gp, asf, avi, divx, dv, dat, flv, gxf, m2p, m2ts, m2v, m4v, mkv, moov, mov, mp4, mpeg, mpeg1, mpeg2, mpeg4, mpg, mpv, mt2s, mts, mxf, ogm, ogv, ps, qt, rm, rmvb, ts, vob, webm, wm, wmv. It is popular among users due to its ease of video transfer from any PC, subtitles support with option to download them, gesture support, PIN lock security and more features. But one thing to keep in mind is that to enjoy the full features, you need to pay for $2.99 to get the Pro version. Oplayer is an iOS app for iPhone, iPad, and iPod Touch. It can play nearly all video and audio formats like AVI, WMV, MKV, FLV, MPG, MP4, Webm, VOB, MP3, WMA, WAV, OGG, FLAV, etc. It also supports multiple audio tracks, so you can change the audio track as you like. Other main features covered by Oplayer are: USB sync to fast sync movies to your device, WI-Fi upload, FTP server – client, SAMBA client, Dropbox support, exclusive file management, different play modes, dynamic menu, TV out, iTunes backup,etc. Note that the paid version of Oplayer covers more functions than the free one. Air Playit HD is a free video player able to play multiple formats for iPhone 8, iPhone 7, iPhone 7 Plus, iPhone 6, iPhone 6 Plus, iPad, etc. It is also a streaming tool able to stream a great number of video and audio formats to Apple devices and Android devices. Supported formats: MKV, M2TS, AVCHD, TP, MPEG-TS, AVC, MOD, MPEG1/2, WMV, ASF, AVI, MOV, RM/RMBV, FLV, MP4, H.264, M4V, WTV, WebM. Other features are : you can set permissions to open folders, resume downloading at break-point, automatically list the recent played videos with remembering last point of each video, add remote server by specifying IP address, Adjust video/audio quality and resolution for each video individually, etc. VLC Media Player is reputable and functional as an open-source cross-platform media player. VLC for iOS is as excellent as that we have been using for years on PCs. With VLC players for iOS installed on your iPhone, you can enjoy all media files without format restrict. It also supports multiple audio tracks including 5.1 and subtitles tracks including SSA. You can use VLC for iOS to adjust video speed, brightness, volume, etc and forward or backward as you like. KMPlayer, originally designed for PC users and now has Mac version, has become one of the most popular multimedia players in the world supporting 36 languages. KMPlayer video player for iPhone contains all the codec you need like 4K video codec, H.265, VP9, etc and supports for high movies including 3D, 4K UHD, 1080p, etc. This iPhone video player app also offers the posibility for you to control the volume, the navigation, and turn on/off subtitles. Even with a powerful video player, you may still get trouble during video playback on your iPhone. Sometimes, a special video format may cause your iPhone crash. Therefore, video conversion is quite urgent. Just try Pavtube Video Converter Ultimate (best Video Converter Ultimate), which is an iPhone video converter that could help you convert any video to iPhone supported formats like M4V, MOV and MP4 from various formats like AVI, MKV, RMVB, MTS, MPG, FLV, etc. The biggest highlight of this iPhone video converter is that it can make Blu-ray/DVD sources playable on your iPhone. Amazing work! You can play a self-created video on your iPhone by using the editing functions of this conversion program. For Mac users, please use Pavtube iMedia Converter for Mac, which can make you achieve iPhone playable video on macOS High Sierra, macOS Sierra, El Capitan, etc. How to Convert Video to iPhone with Pavtube? The below step-by-step guide would show you how to convert video format so as to let you freely play video on iPhone without the need to install 3rd-party iPhone video player apps. You can do this in two ways. First, you can drag and drop the files into the program. Second, you can “File”. This opens a new window where you can select the video files you wish to convert to iPhone. Once you’ve uploaded your files you can preview them, even merge them. Click the drop-down box "Format", Go to "Common Video" or "HD Video" to select an iPhone friendly video format like MOV, MP4, or M4V as output. Or you could directly choose an iPhone profile under the "iPhone" category. If you want to create a custom video, you have the option of making edits before converting. The editing settings can be made after you click on the “edit” button within the main window. 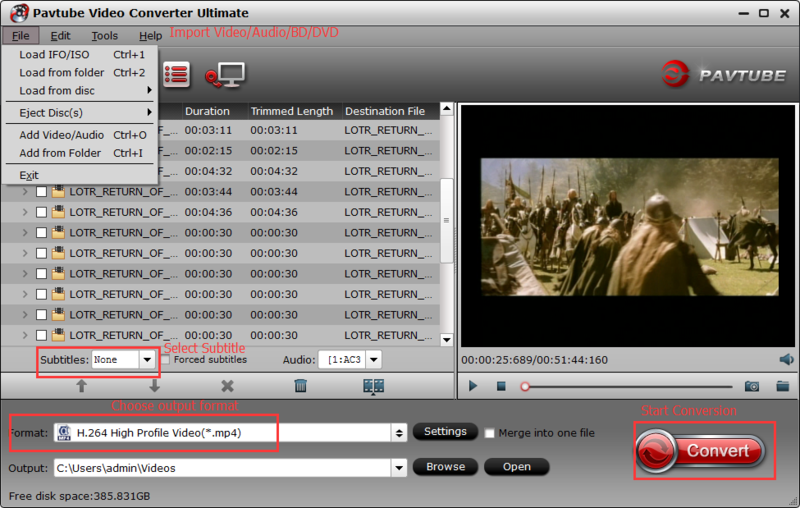 Some of the edit function you can make by using the Pavtube Video Converter Ultimate include cropping, trimming, rotating, changing brightness and contrast as well as adding subtitles. You also can click "Settings" to adjust A/V parameters. After setting output format, click the "Browse" button to set output directory. Finally, click the bottom "Convert" button on the main interface. 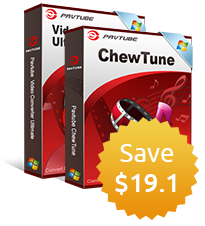 Pavtube Video Converter Ultimate would start to decode and convert video to iPhone player friendly video formats immediately. When the conversion finishes, click “Open” to find the converted video files. Then you can effortless transfer the video files to for playback on the go.